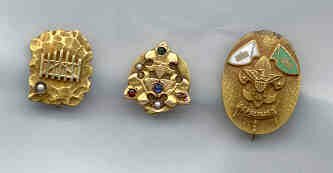 These were the three pins from the Senior Honor Degree Society. The one on the left is the Merit Degree pin with a pearl inset. The middle pin is the Honor Degree Pin with jewels. It has three FDL's in a circle. The pin on the right truthfully (not pictured in the books) is unknown other than it is obviously from the group. It is enameled and I believe either is for Degree Masters (adult leaders) or is for recipients of the Roosevelt Citation which was the highest honor in the organization. All three are 10ct gold. Senior Degree Honor Society - Originally known as "Senior Division", the Senior Degree Honor Society was created by Frank F. Gray in Montclair, New Jersey in 1917 while he was the Scout Executive there. In November 1923 the Brooklyn Council was seeking an "older boy program" to implement in their area and selected the Senior Division out of several that they reviewed. Adult leaders were called degree masters with a suggested minimum age of thirty. The Brooklyn Council published a copyrighted Program Manual in 1937 which had an introduction page written by James E. West who was a member of Senior Degree. While it was a boy's organization, the top adult in the Brooklyn program from March 1924 through June 1926 was Charles Bingham whose title was "Degree Master General" which was the highest adult position within a council (Similar to an OA Lodge advisor). When he moved to New Jersey, he resigned and was followed by Kahl C. Bates who had served as a District Degree Master. By December 1926, all seventeen Scout districts in the Brooklyn Council were using the program with a chapter having been organized in every district. All seventeen chapters were still functioning as of early 1937 when they published their Program Manual. It appears that the National Council gave official approval to the organization as the front cover of the 1937 manual has printed on it "National Council" "Senior Degree Honor Society, B.S.A." "80 Maiden Lane, New York, N.Y." not to mention the endorsement of James E. West. (Although National Council may have been referring to a national governing body of the organization itself.). It is also mentioned in the 1938 BSA handbook "Adventuring for Senior Scouting". It is noted in the manual that the organization existed in other locations with Westfield, N.J. being specifically mentioned. It was started there in about 1931 and the Westfield Scouting community reported that the program was spreading to neighboring communities. and the second being the Honor Degree. 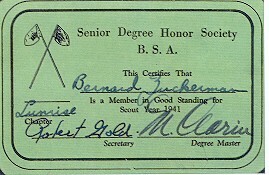 The Honor Degree could not be obtained before a scout's 18th birthday. After reaching his 21st birthday and casting his first vote as a citizen, an Honor Degree member could receive the Theodore Roosevelt Citation. It was named as such with the permission of Roosevelt who apparently also gave approval to the program. There were three lesser citations with the Honor Degree, which were the Third, Second and First Order Citations. The Honor Degree could not be methodically earned. It was bestowed upon each member by others in the chapter. Failure to receive the Honor Degree by the 21st birthday resulted in being made an alumni member (non-active). Honor Degree members were to be made alumni members by their 25th birthday at the latest. The group's organization included inter-chapter councils with each chapter having a representative. The 1937 manual stated, "general activities and procedures are governed by National and Chapter constitutions". It gives the appearance that there was a national body of the organization. Each chapter had a President, Vice President, Treasurer, Recording Secretary, Corresponding Secretary and Sergeant-at-Arms. These officers were allowed to serve as ritual leaders (there could be a separate set of ritual officers) and were to be trained in parliamentary procedure. The inter-chapter councils had similar officers. Work in the chapters was to be done by the committee system. Insignia, degree manuals and neckerchiefs were to be presented to new members rather than charging them for each item. Each chapter was to do its own fundraising to cover these and other costs. The organization was very much service oriented and it also promoted social programs for its members. Girls were to be included in these social programs although it stressed having chaperones. Whenever the name was changed from Senior Division to Senior Degree is unknown at this point but it was still called Senior Division in May 1929 but was changed by 1937. Some of the District names in Brooklyn were Bath Beach Chapter, Bay Ridge Chapter and Sunset Chapter. One thing I thought interesting was that wearing the Scout uniform at business and social functions was not required and was totally optional. However at ceremonies they were required WITHOUT exception. Minimal amounts of adults attending meetings were encouraged so that they (adults) didn't take things over. Elections were annual. The insignia of the Senior Degree Honor Society was a rectangular felt patch worn on the right uniform sleeve. The colors were green, white and red. 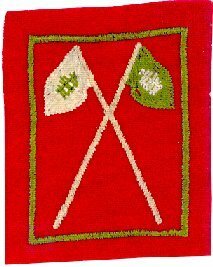 On a red background, the crossed "gate flags" were embroidered in green and white and the border was green. 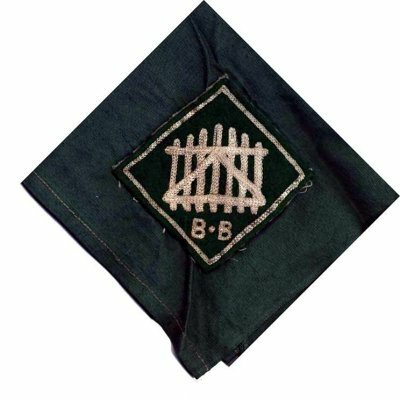 This was the Merit Degree patch. The flags were called "Bannerets". The green banneret with a white gate on the left was called "Firmness". The white banneret with the green gate was called "Purpose". These were used in the rituals. 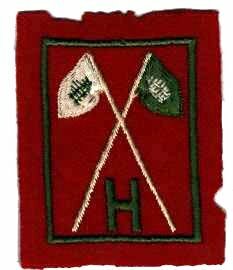 The Honor Degree patch was the same except it had a green embroidered "H" added to it. Many if not all of the different chapters had distinctive chapter neckerchiefs. There were also civilian lapel pins for each degree. The Merit Degree had a "Gate of Decision" pin and the Honor Degree had a round pin with three stars and fleur-de-leis on it. There was a third pin that is not pictured in the manual but is believed to be for recipients of the Theodore Roosevelt Citation. All three that are pictured came from the same original owner and he verified that all three were from the Senior Honor Degree Society. It appears there was also a separate ritual manual for each of the two degrees. Every member was to have a staff (walking stave) 6'6" long and upon it he was to carve his personal Scouting history. This staff was used in all rituals. Each member also made his own banneret as a Merit Degree member although it would not be used unless he became an Honor Degree member. The banneret was the same shape and size as a patrol flag (11"x18"). It was always a green background color representing service and was to have a design that was symbolic of a worthy ideal. Rank and Merit badges earned as well as camp badges were allowed to be attached to the banneret. Each Honor Degree member's banneret was slipped over the top of his stave for rituals. Without the stave (called "The Staff of Record") and the personal banneret, the Honor Degree member was NOT allowed into the rituals. Once they entered, all staffs/bannerets were placed upon the Alter of Service until they left. This society was highly ritualistic. Hazing of new candidates was forbidden. There was a degree chamber (room) which had an alter (of Service) and a fire (of Friendship). There was a gate that the candidate and all members had to pass through for ritual gatherings called the "Gate of Decision". The Merit Degree ritual included "The Story of the Stone" which involved the use of a fossil to tell that everything has a purpose in the scheme of things. There were three "Great Questions" to be discussed and a pledge to be taken. There was a candle ceremony called "The New Light" and a "Story of the Coins". At the end of the ritual the new member received instruction in the "Sign of the Tepee" and the "Sign of the Gate" then received his emblem, pin and Merit Degree manual. There were solemn processions into and from the gatherings. This information came from a Merit Degree ritual manual. The ritual for the Honor Degree may have been very different. I do not have an Honor Degree manual from which to know. Ritual books were given ONLY to adults. Although I am not a member of any Masonic organizations I believe that the Senior Degree Honor Society was created with them very much in mind. The OA existed at the same time that the Senior Degree did in Brooklyn so it was not replaced by it. The Senior Degree program was recognized officially by the National Council of the BSA in 1937 as they stated its approval as an official BSA program in the 1937 Annual BSA Report to Congress and listed it in the 1938 printing of "Adventuring for Senior Scouting". On page nine it lists opportunities for Senior Scouts that include "Press Club, Knights of Dunamis, Senior Honor Degree and the Order of the Arrow". It is Scouting Historian Paul Myers feeling that when the Explorer advancement program came in (Ranger Program) and older boys had awards to work towards inside the Scouting program that Press Club and Senior Honor Degree declined. How far Senior Honor Degree spread and which councils in total used the program is also unknown. It was reported in the 1937 Annual Report that by December 31, 1937 the program had 33 chapters in New York, New Jersey and Florida with an active membership of 1,102 individuals. This 1941 Membership Card was scanned and provided courtesy of Martin Rubin. This card was for the Sunrise Chapter. The sources for this article were copies of the 1937 program manual, the 1925 and 1929 Merit Degree ritual manuals and a copy of a Brooklyn Scout troop newsletter from 1929. A very special thank you to Paul Myers for use of his extensive records and again to Paul as well as the National Archive of Twentieth Century Scouting Memorabilia for scans of their Senior Degree Honor Society memorabilia that is included with this article.